If you watched these two teams in Week 3, you’d think Tampa would have no chance in this game. Wrong. Pittsburgh dominated the game from a yardage perspective in the first half. However, the Steelers were extremely sloppy with penalties, bad field position, dropped passes, poor OL blocking, etc. This also led to an early sack fumble that the Buccaneers turned into an early TD. But most importantly, the defensive losses, especially Ike Taylor, were painful for the Pittsburgh defense. Also, credit the Tampa Bay coaching staff for getting this team back on track, and it always helps when your backup QB has a week to prepare instead of coming into a game in the middle of a blowout. Mike Glennon – Only a 50% completion percentage, but Mike Glennon played better than that indicates. What I mean by that is he consistently threw the ball deep, and even though he overshot a few guys, he threw to a lot of places where the taller Tampa receivers had a chance to make a play on the ball. Glennon’s one INT wasn’t on him. He threw the ball deep to Mike Evans, but that’s when Evans suffered his hamstring injury as he stopped running his route early. Essentially, the ball was left for Cortez Allen to pick off and essentially worked out like a short punt anyways. It’s unclear who will start for Tampa Bay next week, but against a bad Saints defense as a big underdog, Glennon could get some substantial garbage points in that scenario. He threw for 287 against Pittsburgh. Doug Martin – There were some concerns that he would split time with Bobby Rainey. Martin got 14 carries to Rainey’s four. Martin only averaged 2.9 yards per carry, but I blame that more on the poor blocking of the Buccaneers. Martin’s TD also came on a stretch run to the left, but the refs missed an incredibly obvious hold with Sean Spence well in position to stop him for a loss. Still, with no Jarvis Jones and Ryan Shazier for Pittsburgh, it’s a little perplexing. Martin looked healthy for the most part and picked up an additional 16 yards on two screen passes. With Tampa as a huge dog against New Orleans, I don’t like him that much, especially at $7,100. But New Orleans’ rush defense has been terrible this season, and using him in a GPP or two wouldn’t be a bad idea. Mike Evans – This is where the absence of Ike Taylor really hurt the Steelers. Both Evans and Jackson are 6’5″, and Taylor is 6’2″, which isn’t a huge difference. William Gay and Cortez Allen are 5’10” and 6’1″, but Allen isn’t nearly the cover corner as Taylor is. Evans was targeted seven times with most of those coming in the red zone and early. He caught a TD on a fade route in the beginning of the game and caught another deeper pass in the back corner of the end zone, but he was barely out of bounds. It was the first time we’ve really seen Evans display his athleticism in the NFL, and I think we can expect more of this. Unfortunately, he did suffer a groin injury in this game, and he will be out two-to-four weeks. He should have had a bigger game than he did. Vincent Jackson – While Evans was the primary target early on, Vincent Jackson saw more looks after Evans went down. Even though he caught only three of his 10 targets for 32 yards, he did catch the game-winning TD with under 10 seconds remaining. Jackson was dealing with a wrist issue, but the lack of catches more had to do with throws slightly off target. With Evans out, give Jackson a bump against New Orleans. Louis Murphy – Caught six passes for 99 yards and was targeted 11 times. All were team highs. He is the No. 2 receiver until Evans returns. Interestingly though, Murphy isn’t in FanDuel’s database, and he is $3,000 on DraftKings. I highly advise using him against the Saints. Patrick Murray – Made both of his FGs. 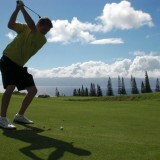 While the second one was a chip shot, his first came from 50 yards. He doinked it off the inside part of the left upright and went through. However, this was a great line drive kick considering it was towards the open end of the stadium at Heinz Field, which is one of the toughest end zones to kick to in the NFL. There are usually swirling winds coming off the three rivers. Tampa Bay DST – The one thing to like here was that they got five sacks on Ben Roethlisberger. One (maybe two) was due to Ben holding the ball too long, but the others were due to a fantastic pass rush. This Steelers OL is actually healthy too, which is unusual. I wouldn’t say rule them out every week, but they obviously aren’t being put in any lineups at New Orleans. Ben Roethlisberger – Outside of the five sacks (one fumble lost), Roethlisberger had an outstanding day. Again, this was more poor OL play on the sacks given upBen showed off some flashes of the mid 2000s with his mobility and made some crazy scramble throws. Ben has been so banged up the last few years that we forget he can still do that. Antonio Brown is a top-level WR, LeVeon Bell is a great pass-catching back, Markus Wheaton is coming on and Heath Miller is still Heath. He’s still underrated by many, and he should certainly be played in all formats against Jacksonville next week. Le’Veon Bell – After the Falcons ran the ball so well on the Buccaneers and the Steelers ran it very effectively against the Panthers, Bell was projected by many to have a great game. The Steelers OL just simply didn’t handle the Buccaneers front four well, and Bell only got 63 yards on 19 carries. Bell actually had some great runs just to get that much yardage. Luckily for Bell owners, he racked up six catches for 46 yards to avoid a complete dud. The Steelers also ran it well against the Browns in Week 1, but had their troubles in Week 2. Seeing as they face the Jaguars Week 5, Bell should get back on track and is a top play. 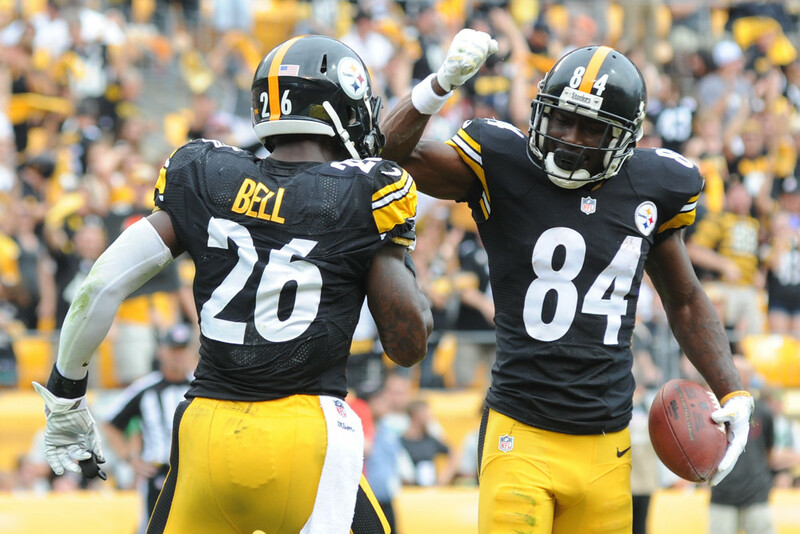 Antonio Brown – It was another great day for Brown with seven catches for 131 yards and two TDs. On one of these scores, Brown completely shoved the defender over (no call), but made a spectacular diving catch. The other he caught in traffic in the middle of the end zone. However, Brown blew a potential huge play for Pittsburgh in the fourth quarter that would have likely won them the game. They ran a flea flicker, and Brown completely burned the secondary, but even though Ben put the deep ball right on the money, Brown dropped it. That’s a rare sighting for him as he almost always makes that catch. Despite that and Brown is up to $9,000, he’s obviously a great play against the Jags. Markus Wheaton – I’m always on the verge of recommending Wheaton each week since he does something impressive each outing. It was another four catches on six targets for 57 yards. One of these grabs was over the middle of the field, and he made a leaping grab in the middle of traffic that was fairly difficult to do knowing he was going to take a good hit. Wheaton also got a carry on a reverse, but the defender easily sniffed out the play and Wheaton had no where to go. I wouldn’t use Wheaton in cash games, but GPPs at $5,300 is certainly in play. Heath Miller – A flashback game for Miller of 10 catches for 85 yards and a TD. He originally caught a TD that was called back for a holding penalty. Yet, a couple plays later, Ben found him again over the middle in traffic for the score. Miller was used in a few more instances this week than we have seen so far this year. Not only was he used in standard pass, but Ben ran a couple read-option plays where he faked the run but threw it quickly to Miller over the middle when the linebacker shifted expecting run. Despite Miller’s emergence, this is definitely an above average game for the veteran tight end. His price jumped to $5,900 and many other people will use him after that performance with the Jacksonville on the horizon. With other TEs I like more at that price, I wouldn’t mind fading him here. But other than that, he’s certainly still a legit play. Shuan Suisham – Suisham is pretty much automatic inside 50 yards. Anytime he gets around that number or higher, it’s iffy. That was the case as he missed from 50 at the end of the half. Again, this was at the tough end of the field where it’s toughest to make kicks. Although, he just simply left this one out to the right as the kick was from the right hash mark. Therefore, you could technically say he has a limited ceiling, but kicking against Jacksonville is always ideal, especially when your price is $4,800 on FanDuel.